Every now and again a brewery will experiment to combine and mash together two different styles of beers. The results can be a mixed bag. Cascadian Dark Ales are some combination of porter with a big, dank, Pacific NW IPA. Some of those beers I truly enjoy, some definitely miss the mark. I’ve heard a lot about West Coast breweries trying out smoked IPAs. As experiments these can be fun beers to try. With further refining the beers that were too weird to quaff can perhaps begin to have some drinkability to them. So perhaps it’s surprising that not many breweries have experimented with big hops and lactobacillus? We’ve seen some fun, recent, experimentations with hops and Brett. But what about hops and lacto? How about a beer that is at once bitter, hoppy, and tart. I don’t know a lot about the science behind lacto, but upon quick glance at some forums it looks like Lactobacillus has a difficult time working when hop’s beta and alpha acids are around. This is why you will see brewers use oxidized hops, old hops, and the beers will have very low IBUs. 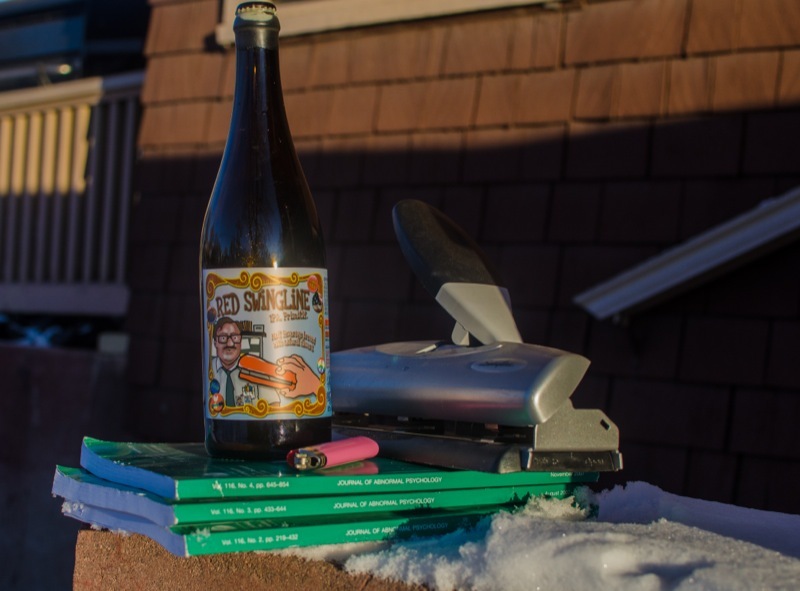 In the last couple weeks Trinity Brewing released the Red Swingline, part of their Office Space series of beers. The beer was brewed with large amounts of hops some coriander and tangerine zest, fermented with Lacto and Bretta, dry hopped, and aged in French Oak Barrels. I picked up a bottle of the beer, and I gotta say this was a fantastic beer. Now it’s not as sour as other Trinity beers, but there’s some good tartness there, there’s definitely some Brett funk, and there’s definitely some big grapefruity hop aroma and flavor. In fact, I think the combination of the funk aroma and hops makes me think a little of Citra hops too, like in Sierra Nevada Torpedo. The beer is really citrusy and there’s a complex dance of citrus hop and citrus from the Brett. The beer is not smack you in the face bitter, as you would expect from a super bitter IPA, but I do think there was some light perceived bitterness in there playing at the same time as the tartness. And the kicker? It sits at a low 4.1% ABV! Tons of flavor packed into this low alcohol beer. This was a really fun beer. Red Swingline is very unusual and unique while maintaining a really nice sense of drinkability. It doesn’t come off as an experiment either, it feels like a solid part of Trinity’s lineup. Hat’s off to Trinity Brewing. I believe this could be the beginning of some really exciting experimentation in this area. Perhaps someday we’ll see beers that are at once very bitter and very sour? Trinity takes us a step in that direction.